ACCUPHASE golden voice announced the launch of a new flagship pre-C-2820, it was introduced five years ago 21hifi flagship C-2810 the first follow-up model, located in the top audio market. In the upcoming 2011 Guangzhou Advanced Audio Show (November 4 - November 6, Baiyun International Convention Center), there will be dozens of Super HI-END flagship audio /theater system demonstration, and the famous music Artist-site interaction with the audience, part of the flagship product in the domestic performances only once, Do not miss enthusiast friends. new flagship pre-amp, loaded with the new upgrade AAVA (Analog Vari-gain Amplifier) ​​modes e analog volume control and channel balance adjustment, excluding mechanical contact points of the volume institutions, escape the traditional resistive sound control technology, so that music signals without variable resistance, the impedance change is entirely free from influence of passive components, can greatly improve the signal to noise ratio and distortion and makes the sound quality further improved. AAVA although they are electronically operated, but it is analog operation, thus eliminating the digital /analog conversion between straightforward, but also eliminates the general tone potentiometer rendering. And the upgraded version of AAVA electronic systems through the use of high-precision SMD components and more advanced welding process, so AAVA systems more precise, left and right channels consistency excellent, as well as by weak interference distortion may also be reduced, that C-2820's sound is more pure, more precise operation. 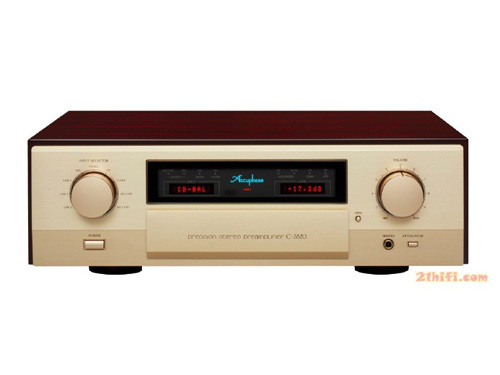 ACCUPHASE C-2820 is a stereo pre-amplifier, located in the golden voice of HI-END flagship model, in addition to signs of thick golden voice luxury champagne panel, also particularly in the fine grinding of logs installed shell can increase the acoustics of the box, but also give people more noble feeling. C-2820 with full separate left and right channels of the design, supply from transformer, around the beginning has been completely independent of filter configuration, left and right channels independently cavity shielding design. This "inside the box" dual mono design, both the absolute isolation of interference between left and right channels, but also indicators of left and right channels to ensure consistency is achieved through the program. Two power supply systems are left and right channels, power supply upgrade to higher quality ring two cows, with 4 x10, 000μF custom audio grade power supply filter capacitor, and C-2820 plus the power input is also a set of power filter, so each group to ensure that pure power.